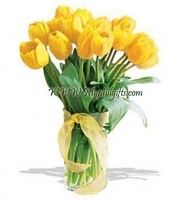 12 stems of royal bright yellow tulips in a clear glass vase. Glass vase may vary. Our Cut off time is 10 am local time for same day delivery. Order received after 10 am will be delivered on the next day. Our shipping charge is $7. Tulip is strictly to Metro manila Delivery; we do not deliver Tulip to provinces. Vase or Basket is include for the provincial delivery however it might be delivered as separate items in a quality box and some design assembly is required by the recipient.